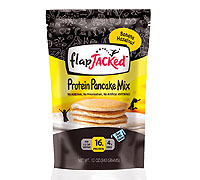 Our Banana Hazelnut Protein Pancake Mix is made with whole oats and sweetened with bananas. This protein pancake is loaded with potassium and fiber. Hazelnut meal adds vitamin E in addition to B vitamins (including folate) and is also a rich source of potassium, calcium and magnesium. With only 200 calories per serving, our Banana Hazelnut Protein Pancake Mix has a sweet, nutty flavor while modestly packing 16 grams of protein and 4 grams of fiber in each serving.